If your kitten shakes uncontrollably, he may be experiencing tremors. Kittens that display involuntary muscle movement or have an uncontrollable twitch may suffer from tremors. Feline tremors can affect any part of the body and may be present at birth or develop later in life. While your wobbly kitty’s rhythmic shaking can be scary to witness, treatment is typically available. 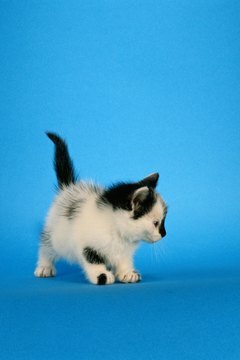 Kittens with ataxia possess an abnormal or unsteady gait. Most cases of ataxia in felines are caused by neurological problems that affect kitty’s sense of motion, resulting in tremors. Cerebellar ataxia is caused by a problem within the cerebellum, the section of brain responsible for balance and coordination. Vestibular ataxia is caused when a problem is found in the inner ear or nerves, connecting to the brain. Sensory ataxia is caused when a problem arises in the spinal cord, brain or peripheral nerves, which are needed to engage in limb movement. In many cases, the cause of ataxia is due to abnormal development of the brain, often due to exposure to toxins or the feline panleukopenia virus while in the womb or from an inherited disease. Metabolic problems in kittens can result in weakness, tremors, ataxia and even seizures. Tremors can appear in just one area (localized) or take over kitty’s entire body (generalized). Low blood glucose, diabetes mellitus and low blood calcium are just a few of the reasons that tremors could occur. In some cases, kittens who are malnourished or have nutritional deficiencies, such as thiamine deficiency, can display tremor episodes. If diet is to blame for feline tremors, your vet may suggest a strict diet for kitty, as well as supplements to fill in the gaps. If your kitty is experiencing tremors, a vet visit is crucial. During your visit, your vet will perform a physical exam and obtain information on kitty’s medical background and current symptoms. Routine lab work may be completed to allow the vet to rule out any major illnesses. Consider if your kitten has been exposed to any toxins, his diet, the possibility of nutritional deficiencies, or other symptoms that could point to a diagnosis. If needed, your vet may suggest X-rays, CT-scans or MRIs to look for abnormities. If your kitten’s tremors are a result of a primary disease, your vet will discuss treatment options for the underlying condition. In some cases, certain drugs are responsible for tremors. If this is the case for your kitty, your vet will suggest an alternate medication. Surgery may be needed for tremors related to diseases of the nervous system. In the meantime, your vet may prescribe medication to help control kitty’s erratic movements. Most cases of tremors in felines are treatable, but you may need to monitor kitty at home. Prognosis will ultimately depend on the underlying condition, but in many cases, your trembling kitten can led a happy and healthy life. What Can Cause Low Blood Counts in Kittens? Should You Adopt an Overly Timid Kitten?